QIP - Quilting in Progress! I loaded this Fat Quarter Shop Block of the Month on Vinnie yesterday. Just doing an all over pantograph as I'd really like to get this one finished, and to be honest -- the New York Beauty scared the heck out of me and I was ready for a simple finish this time! It's difficult to capture the quilting in a photo, but you can kind of see it. That backing was something I had yards of in my stash (why - I have no idea), but it goes perfectly with the quilt so I decided to use it! I may even bind the quilt in it - what do you think? 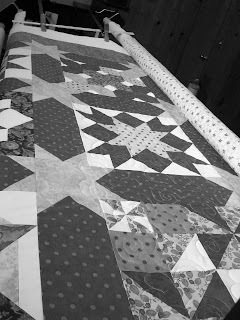 I turned this photo into Black and White which makes the quilting stand out a tad more if you click on the photo. I'm using a silk batting from the Tuscany collection by Hobbs and I really like it! The loft is minimal just like Warm & Natural and there is little to no lint when quilting! Next up I'm using Quilter's Dream Wool which I think will become my standard. These three tools have become very dear to me since I began quilting on Vinnie! 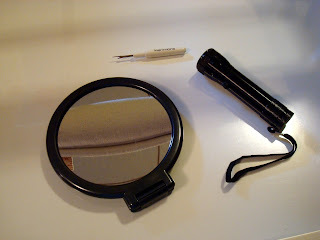 The mirror and flashlight are for checking the tension on the underside of the quilt when it's loaded on the frame. The seam ripper -- do I really have to tell you (wink)? Fortunately the seam ripper hasn't gotten much of a workout yet -- knock on wood! Speaking of tension. I queried a couple of longarm friends about thread recently. Linda over at The Quilted Pineapple said she really likes Isacord. I knew I had some in my thread box from a couple of embroidery projects on my Bernina, so I thought I would give it a try! Turns out I love it! The tension was instantly perfect and I do like the way it looks. Plus my LQS has the entire line in stock - how fantastic is that! I don't have any new quilts started at the moment, but Stephanie will have something fun for me shortly! Today I am playing in the dirt. Mr. Squash and I will be setting out three more raised beds for vegetables! Perfect backing for the quilt Candace, think it would look great as the binding too. I hope you don't have to use that seam ripper to take out the quilting. I hear it is a bear. Looking good,Candace! 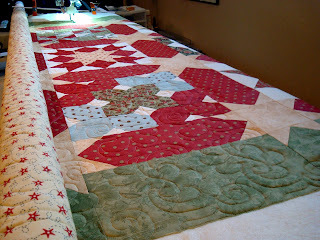 I wonder if that Isacord would make my quilting look good?? Thanks for showing us your progress and tools. Oh, I love that quilt! And the backing really is perfect! What luck that you had enough yardage of it in your stash. Quilting is fabulous. An allover is perfect. I'm so happy that my recommendation of Isacord was a good one!!! I've so enjoyed sharing tips with you! Okay love the quilt andthe quilting... you go girl! Also! Love Bob's shirt! What a lovely looking quilt. I'd love to have a long arm quilter as I am so in the ditch! LOL The backing would work well as the binding too. The colour is perfect. like the backing! And your quilting is good. You and Vinnie are really forming a strong friendship. Thankfully so because you don't want to be friends with the seam ripper! The backing fabric looks like it was meant for the quilt and I think it would look great for binding as well. Your L/A quilting career is moving ahead by leaps and bounds. How excited you must be, Candace. I sure wish it would warm up and stay that way here in Atlantic Canada. I'm longing to start playing in the dirt so badly. I think we're going to head right into summer and skip spring. The backing is very good for the quilt and I think it would look nice as binding as well. - We are waiting to see all snow gone and the ground to thaw before we can start work in the garden. Our tomatoes have made a nice start on the dining table. Beautiful quilt and quilting Candace. You don't need to be afraid of putting anything on Vinnie! Wow. impressive, totally. I'm excited to see what you are doing with the long arm. This quilt is a delight. I like to turn off the lights and just have the light on the longarm for seeing quilting at times. When I photograph...I also turn off the flash and have a back light such as window lighting. This helps to be able to see the texture of the quilting. Your doing wonderfully!!! My favorite thread is Sew Fine....never a problem. I really like the backing..The small hand mirror looks quite familiar. I finally bit the bullet and purchased a longer narrow mirror, the type you attach to the back of a door. I laid it on my longarm table and now only need a light to see the stitches on the back. I see you found the frog stitching tool. Your quilting is coming along really well. You are just jumping right in there with both feet! Tuesday we had a bit of snow here..ugh...I need warm and sunshine...Happy Easter! To longarm quilt your own quilt looks like a lot of fun. Is it difficult ? You have done a wonderful job ! !